Many of you may already have detailed knowledge of the use of CFD in your area of expertise, but it is not often that as a CFD community we can all unite in appreciation of a common group of applications that we can all relate to. With the London 2012 Olympic Games fast approaching, we felt it is worth taking a look at the way in which CFD technology is playing a crucial role in many Olympic sports. You may have already been aware of the tremendous work that companies such as Speedo had invested in CFD technology to keep their products a step above their competitors. In fact, so successful were the Speedo LZR RACER swimsuits developed for the Athens and Beijing Olympics that they were eventually banned altogether (During the 2008 Beijing Olympics, 47 gold medals and almost 90 per cent of all swimming medals were won by athletes wearing Speedo LZR RACER swimsuits)! Research indicates that the new Speedo system reduces full-body passive drag by 17 per cent, improves oxygen economy by up to 11 per cent, and reduces active body drag by 5 per cent when all three components are used together. The new cap, goggle and swimsuit designs were developed in line with rules revised in 2010 by the world governing body of swimming, FINA, which required swimsuits to cover less of the swimmer’s body than the previous LZR RACER swimsuits. 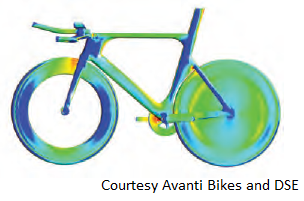 It may now be clear that the latest ANSYS Advantage is focusing on CAE applications in competitive sport. 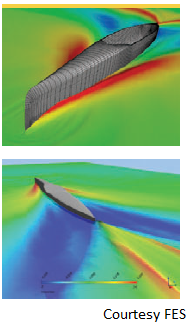 The America's Cup is also considered the pinnacle of competitive sport and the use of ANSYS CFD has had a massive influence on the yacht designs used by the winning teams, all the way back to Team New Zealand's victories in 1996 and 2000 (followed by Alinghi in 2003 and 2007). Team New Zealand are also involved in the seven-month Volvo Ocean Race and have contributed an article to the latest issue which is a must-read for any sailing fans, or indeed anyone who likes to know what it takes to maintain an edge in a highly competitive world such as yacht racing: Charting a Confident Course LEAP Australia is proud to support Team New Zealand with their ongoing use of ANSYS CFD.